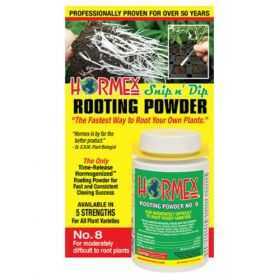 Hormex® Rooting Powders are comprised of 5 strengths of IBA (Indole-3-butyric acid) based Hormogenized rooting powders. After 55 years it's still the finest root producing powder and the only company to offer 5 strengths for every rooting variety and propagating condition. Not all plants require the same strength and we know this. Hormex® Rooting Powders are naturally time released so they remain effective longer than other products on the market. Used for rooting cuttings (cloning) of plants. For moderately difficult to root plants.